Greetings to you all this early morning. It is Liza, the Owner of the Wandering Path. I apologize for not posting yesterday morning but I had to take a bit of a down time as the adverse weather does affect my body and while I may put on a brave face many days, there are others where I must take the time to rest. I carry the selections I do because I believe that often we can combat many things more naturally and lessen the days where we must move slower or not at all because of the afflictions we have to deal with. Over a decade ago, I followed what my doctors advised but found myself feeling the side effects more than ever and that led me down the different path to search out better ways to manage aching muscles, foggy mind, constant pain, and other symptoms . I also understand that each body is different and you must listen to it and find your own way to find relief with as little of those “side effects” as you can. I was very fortunate to have an understanding doctor who allowed me to try different herbal blends and as long as the tests he ran came back the way he wanted them to be, then my chosen path was encouraged, especially since, yes, it did save me money. The graphic below contains the current offerings I have, and while they are not all the blends I would like to carry….they are what I could afford to stock as I began this venture to help others perhaps find relief at a lesser expense than they thought. 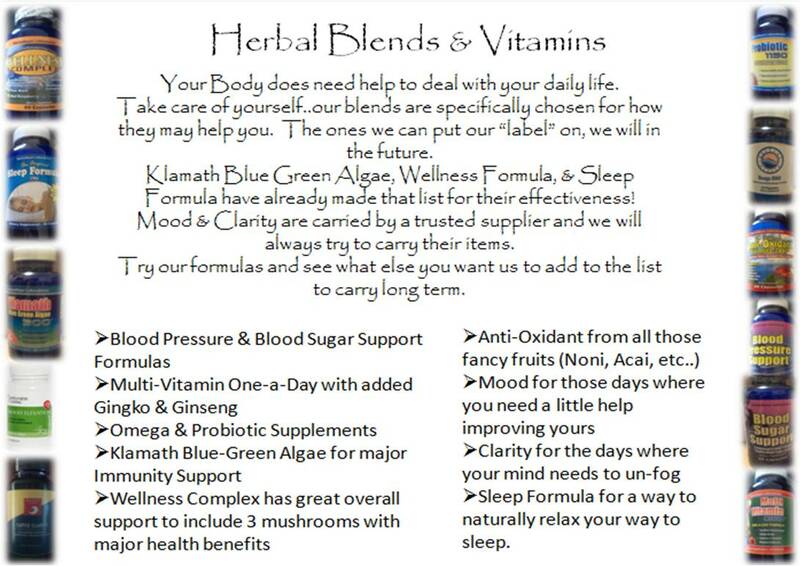 So, for today, this graphic is the overall of the herbal blends & vitamins I carry. Thank you for listening, more tomorrow… With a Raised Coffee Mug. BB! – Liza M.